My Aunt Deb gave me the book, Biblical Healing by T.L. Osborn. At first this book is pretty intimidating. 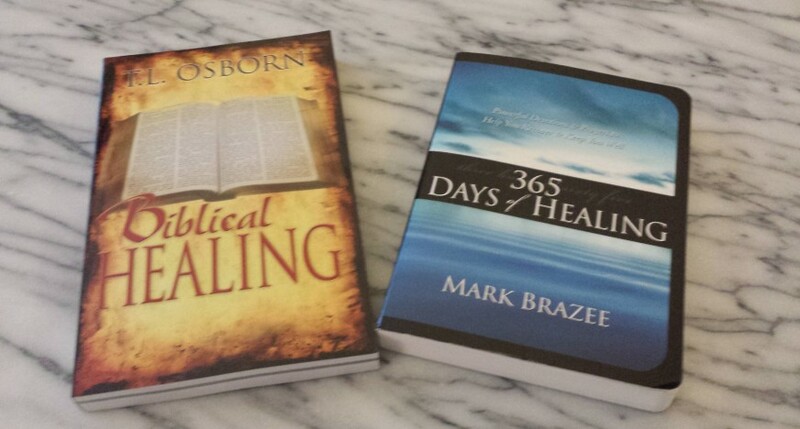 The first half of the book focuses on having faith in Christ and believing Him for instantaneous healing. Pastor Osborn started out doing pastoral work, then went to India to be a missionary only to find that people were not interested in converting to Christianity. He and his family returned to the States and began pastoral work again. During this time they were disheartened but began to learn about healing. They began a healing ministry and went all over the world spreading the gospel of Jesus Christ. Pastor Osborn believes that God is the same yesterday, today and tomorrow and that we can claim the Bible’s promises including healing. Jesus commanded His disciples to heal the sick (Mat.10:1-8) and a disciple of Christ is the same today: “If you continue in my word, then you are my disciples indeed (Jn.8:31). Miracles of healing were manifested in the ministry of the Early Church (Ac.3:6-7) and this is an example of what the church should be today (Mt.28:20). Jesus commissioned all believers to lay their hands on the sick promising that they shall recover (Jn.14:12). They challenge people to walk by faith not by senses. Instead of saying I will receive my healing someday or when I feel it then I will receive it, you should have positive faith saying “I have it now. It is written. It is mine.” (Referencing Gal.5:16-17) A Biblical believer does not doubt that God has healed them because symptoms do not disappear immediately. They are confident in God’s promise, and they rejoice in His word until it is fulfilled in their lives (1 Kg.8:56). While I was reading: “Joshua and his people exclaimed praise to the Lord for delivering the city of Jericho into their hands even while the walls were still standing (Joshua 6:10,16)” I began to smile. After I received my diagnosis and while Wes was on a business trip I listening to praise music with Fierce and felt I should walk around my house praising the Lord with this exact story in mind. I am so glad I serve such a loving, caring and healing God. Many people have sent me verses on either encouragement or healing so I decided to list them here so I could reference them in the future. Be careful for nothing; but in every thing by prayer and supplication with thanksgiving let your requests be made known unto God. 7 And the peace of God, which passeth all understanding, shall keep your hearts and minds through Christ Jesus. 8 Now ye are full, now ye are rich, ye have reigned as kings without us: and I would to God ye did reign, that we also might reign with you. 9 For I think that God hath set forth us the apostles last, as it were appointed to death: for we are made a spectacle unto the world, and to angels, and to men. Praise ye the Lord. Blessed is the man that feareth the Lord, that delighteth greatly in his commandments. 2 His seed shall be mighty upon earth: the generation of the upright shall be blessed. 3 Wealth and riches shall be in his house: and his righteousness endureth for ever. 4 Unto the upright there ariseth light in the darkness: he is gracious, and full of compassion, and righteous. 5 A good man sheweth favour, and lendeth: he will guide his affairs with discretion. 6 Surely he shall not be moved for ever: the righteous shall be in everlasting remembrance. 7 He shall not be afraid of evil tidings: his heart is fixed, trusting in theLord. 8 His heart is established, he shall not be afraid, until he see his desire upon his enemies. 9 He hath dispersed, he hath given to the poor; his righteousness endureth for ever; his horn shall be exalted with honour. 10 The wicked shall see it, and be grieved; he shall gnash with his teeth, and melt away: the desire of the wicked shall perish. My brethren, count it all joy when ye fall into divers temptations; 3 Knowing this, that the trying of your faith worketh patience. 4 But let patience have her perfect work, that ye may be perfect and entire, wanting nothing. Cast not away therefore your confidence, which hath great recompence of reward. 36 For ye have need of patience, that, after ye have done the will of God, ye might receive the promise. Be merciful unto me, O God, be merciful unto me: for my soul trusteth in thee: yea, in the shadow of thy wings will I make my refuge, until these calamities be overpast. 2 I will cry unto God most high; unto God that performeth all things for me. 3 He shall send from heaven, and save me from the reproach of him that would swallow me up. Selah. God shall send forth his mercy and his truth. 4 My soul is among lions: and I lie even among them that are set on fire, even the sons of men, whose teeth are spears and arrows, and their tongue a sharp sword. 5 Be thou exalted, O God, above the heavens; let thy glory be above all the earth. 6 They have prepared a net for my steps; my soul is bowed down: they have digged a pit before me, into the midst whereof they are fallen themselves. Selah. 7 My heart is fixed, O God, my heart is fixed: I will sing and give praise. 8 Awake up, my glory; awake, psaltery and harp: I myself will awake early. 9 I will praise thee, O Lord, among the people: I will sing unto thee among the nations. 10 For thy mercy is great unto the heavens, and thy truth unto the clouds. 11 Be thou exalted, O God, above the heavens: let thy glory be above all the earth. 12 And of Benjamin he said, The beloved of the Lord shall dwell in safety by him; and the Lord shall cover him all the day long, and he shall dwell between his shoulders. 27 The eternal God is thy refuge, and underneath are the everlasting arms: and he shall thrust out the enemy from before thee; and shall say, Destroy them. For I know the thoughts that I think toward you, saith the Lord, thoughts of peace, and not of evil, to give you an expected end. 12 Then shall ye call upon me, and ye shall go and pray unto me, and I will hearken unto you. 13 And ye shall seek me, and find me, when ye shall search for me with all your heart.